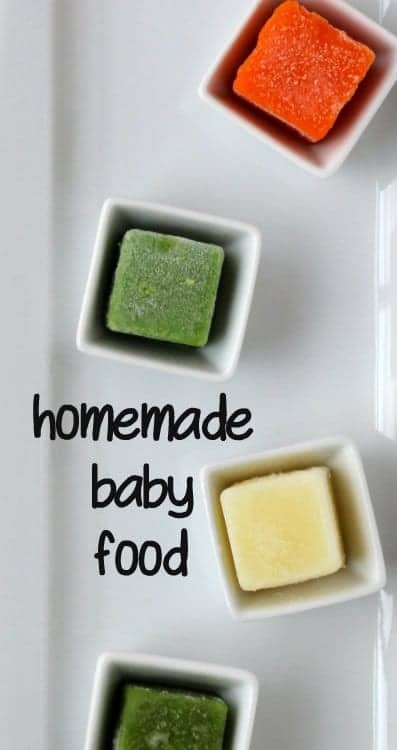 Making homemade baby food couldn’t be easier! Start with vegetables and you’ll gain confidence quickly. 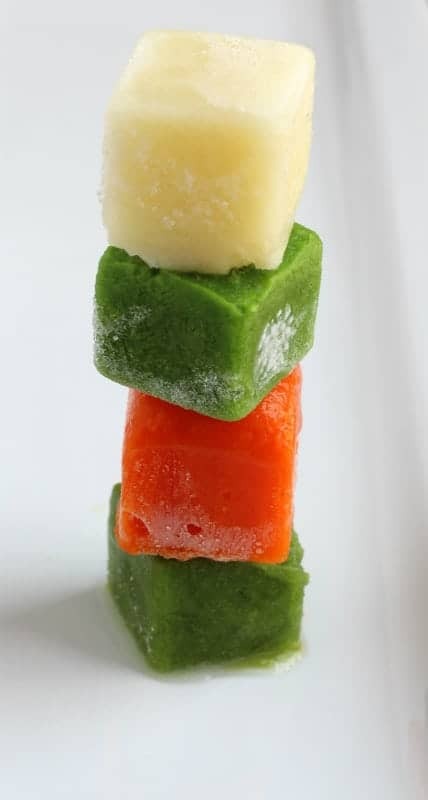 Vegetables are by far my favorite type of homemade baby food. If I’m doing nothing else, I’m pureeing up some veggies for my kids. Why are they my favorite? Well, they are the easiest to make — at least I think they are. It’s also the place where you can save the most money (I think — I haven’t done the math). 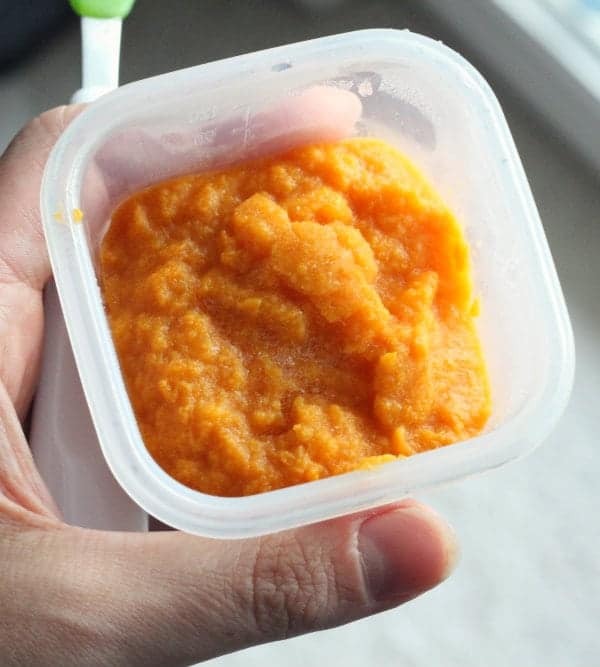 A bag of carrots is super cheap and will make a ton of carrot purée to feed your baby. I also like the versatility that it offers. When was the last time you saw a jar of parsnip or asparagus purée on the shelves of the baby food aisle? Parsnips were one of my daughter’s favorite foods. I’ve mentioned this before, but one of my favorite things about making my own baby food is that you can control the consistency. The first couple of months, I like to purée the food very smooth. Then, gradually, I leave it a little more chunky and introduce my child to some texture. This is by no means an exhaustive list of vegetables. I have found that these are my favorites. Do you have any specific vegetables you’d like preparation instructions for? yield: depends on size of vegetables as well as size of storage containers. About one large ice-cube tray. 4. Place vegetables in steamer basket in saucepan filled with ~1 inch of water over medium-high to high heat and steam about 15 minutes or until tender. 5. Puree (I prefer the blender or food processor for these vegetables), adding enough of the steaming liquid (or water if you’re doing carrots) to come to a good consistency. I like to err on the thick side because it can always be thinned with breast milk, formula or water. 1. Place peas or beans in steamer basket in saucepan filled with ~1 inch of water over medium-high to high heat and steam about 10 minutes or until tender. 2. Puree (I prefer the blender or food processor for peas and green beans), adding enough of the steaming liquid to come to a good consistency. Again, I like to err on the thick side because it can always be thinned with breast milk, formula or water. 1. Preheat oven to 350 degrees F. Wash squash, cut in half lengthwise, clean out seeds, and place cut side down on a baking sheet lined with parchment paper. Roast for 45 minutes to an hour or until soft. 2. Once cool enough to handle spoon squash out of peeling and into the blender or food mill (I love the food mill for squash!). I fit the food mill with the disc that has the smallest holes for the first time. Next time I might use a disc with slightly larger holes to introduce N to more texture. 1. Scrub sweet potatoes clean, poke with a fork all over, wrap in foil, and bake in a preheated oven at 350 degrees for one hour or until tender. 2. 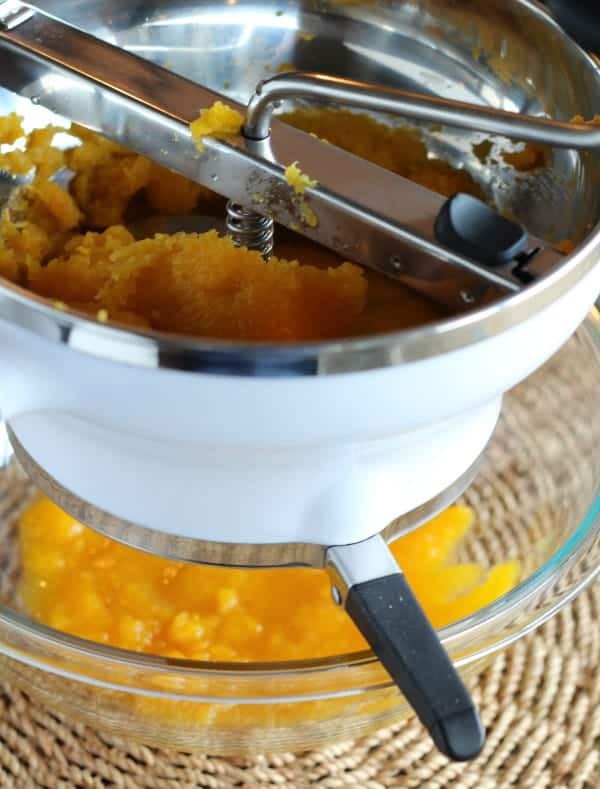 Similar to the squash, once cool enough to handle, spoon sweet potatoes out of skin and into the blender or food mill (I prefer the food mill for sweet potatoes as well as squash). Again, I fit the food mill with the disc that has the smallest holes for the first time N tried sweet potatoes to make sure the smoothest texture. There are of course countless other vegetables you can prepare for your baby but these are some great starter vegetables for the first few months of solid foods. Pumpkin is also a great one for the beginning and can be prepared the same way as the squash. 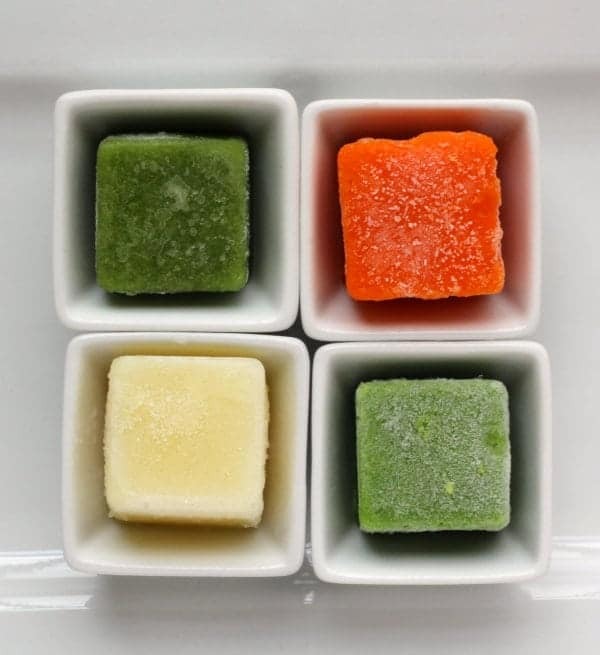 Wholesome Baby Food has great instructions for a number of different vegetables as well as some creative recipes for combining vegetables with other foods. Refer to my overview post for general instructions regarding preparation and storage of homemade baby food. 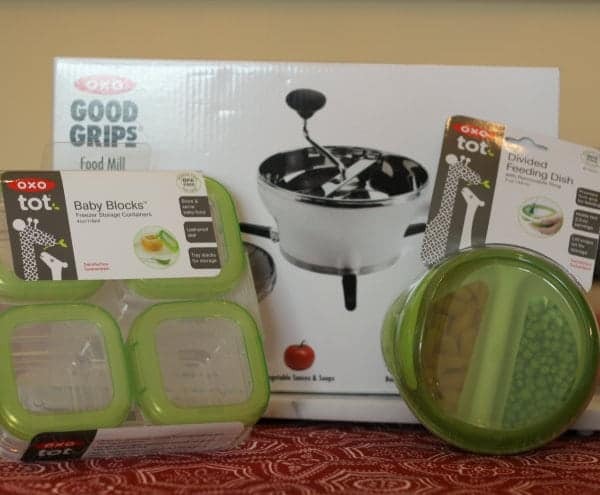 One (1) winner will receive an OXO Food Mill, a Divided Feeding Dish, an On-the-Go Feeding Spoons, and a set of Baby Blocks 4 Ounce Freezer Storage Containers. All of these things will make your baby food preparation, as well as feeding, a breeze. 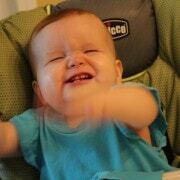 I LOVE the spoon — it is perfect for the baby’s tiny mouth, soft and flexible. It is comfortable to hold on to and the travel case makes it perfect for tossing into the diaper bag. The feeding dish is perfect and the grippy bottom will be great with N starts to try and feed himself. It also comes with a great cover. The freezer containers are great for storing the food in the fridge or freezer but also for reheating. The lids have a venting feature that is so helpful. And then the food mill! That’s obviously the cat’s meow. I made applesauce and didn’t have to peel or core the apples! The food mill did all the work. It was great for making a super smooth puree out of the sweet potatoes and squash. It will be used frequently in your kitchen, for baby food or any other purpose! 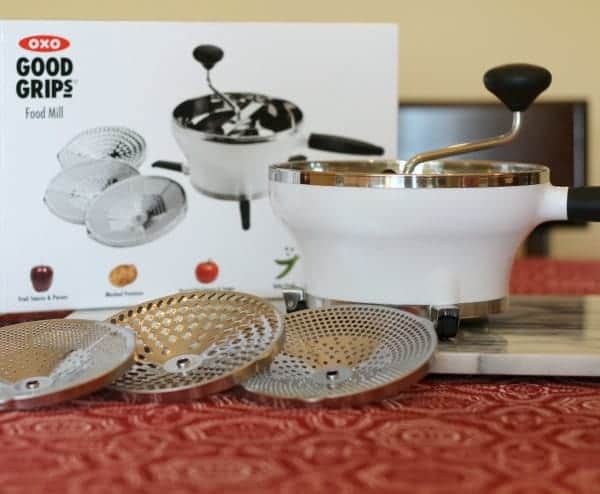 All the stuff is high quality, just like you would expect from OXO and OXO Tot. Use the widget below to enter the giveaway. It make take a second to appear. Any comments left on Rachel Cooks will be moderated within 24 hours. If the widget does not appear, you can follow the link to enter. Good luck! Win OXO Baby Food Essentials! Disclaimer: I am not a pediatrician nor a dietitian. Check with your doctor before introducing solids and definitely use this only as a rough guideline. Always trust your gut and do your research. I’d make something green–spinach with a bit of applesauce maybe. 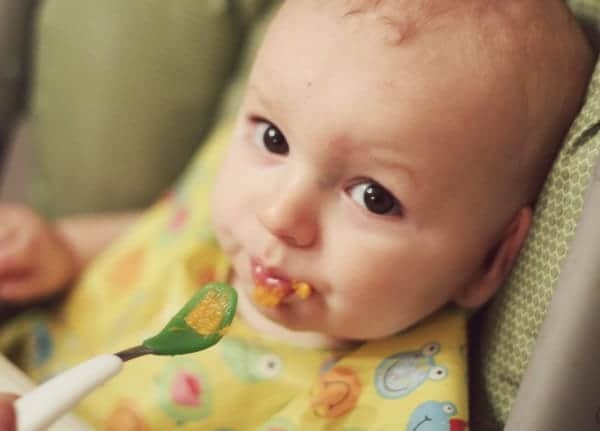 Babies aren’t supposed to eat leafy greens though (before the age of 12 months). My niece was just born, so when they visit, I would make some baby foods. Maybe an apple, blueberry, and sweet potato mix. I would probably make a fruit mix, maybe bananas and berries. the first thing I would make would DEFINITELY be pureed beets! I love the flavor of long roasted beets, so I would definitle puree them up for the little one! I have a very large garden and I would use this first for zucchini, squash and sweet potatoes. Oh m gosh! I want to win this SOOO bad!! Logan is just getting ready to turn 4 months and I’m super excited to start making my own food for him! [a little sad though because that means he’s growing up] I think the first thing I would make for him would be CARROTS! They’re my favorite veggie and I just love the bright orange color! I think I’d try mashed potatoes, because I’m curious what the texture would be like! Applesauce. SW MI apples this year, unlike last year!! I have two 8 month old grandchildren and need equipment to make them organic food here. They already love sweet potatoes and peas! But those packages are in plastic– that scares me. BHA and BHT are not the only dangerous chemicals leached out of plastic. Olivia is just now starting to eat things that I cook for her. She only wanted the pouch food but I’m so glad she is getting away from that because it’s getting expensive. Peaches would be first since we just picked a bushel of them! I would use the OXO food mill for the first time to make and freeze homemade tomato paste, the little cans are expensive and I almost never use the whole thing. Since I have a baby who will be starting solids in the next few weeks I’d probably use it for a sweet potato or squash purée. But I think I’d also like to try it with mashed potatoes. I think that would be interesting as well. The squash recipe – thanks!! Baby girl isn’t quite ready for solids but will be very soon. I want to start her on veggies so she develops a love for them that I don’t possess. Definitely starting with the yellow vegetables! I’m due in December and I’m definitely planning on making my own baby food – it just makes so much sense to me! I would do the carrots first! 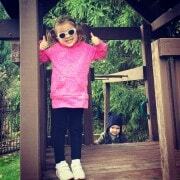 Even though I don’t have kids, I am totally bookmarking these for if/when that happens! So informative! I’d love to make tomato puree/paste. So neat! I would love to make some applesauce for my little baby-to-be! He gets here in just a few days and I can’t wait! I love the consistency of mashed potatoes from a food mill. That would be the first recipe I’d try! I’d do sweet potatoes with bananas. I’ve always wanted to make mashed potatoes from a food mill, so I would make that first! Carrots but maybe roast them first. I’d love to have the foodmill to prep food for my husband who just had a gastric bypass and is eating pureed foods. I could also use it for jams and jellies, tomatoes, etc. Such a versatile item! Pumpkin. My daughter still hasn’t tried it. Although she’s moved on to table food I still find this post very interesting! I made most of my daughter’s food and I’ll make baby food again for whenever we have our second child. Great post! I think the first thing I would make with a food mill, would be a super smooth mashed potato for my hubby. With my daughter we started with sweet potatoes. Since they aren’t quite in season, I would probably start our 5 month old with something green. Maybe peas? They are my favorite! I would use it to make gnocchi and once the baby gets here the first baby baby food will be carrots. So informative…definitely going to need this someday! I would likely use it to make some jam as so much good fruit is in season now. So excited to make baby food for my little girl! Just started baby girl #2 on solids 2 weeks ago. Would love the mill-haven’t tried sweet potatoes yet but it was my first daughters favorite! I would make peas with mint. I would make healthy meals for my granddaughter. Squash, fruit, chicken, and green beans would probably be first choices. Definitely would make some mashed potatoes! I would love to try to make my own sauces, jellies and purees! 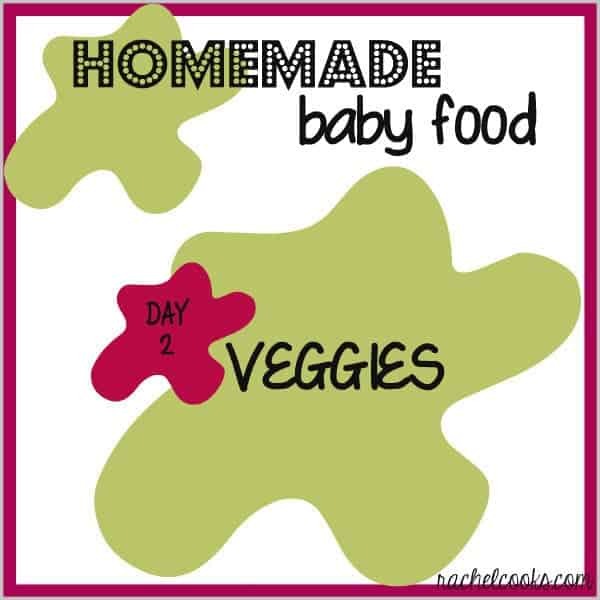 Making things homeade would be so much easier and when I have kids I want to make my own baby food! I would make apple sauce! Almost apple season here! I would make baby food for my nephew! I would make kale, apple, spinach, peach. Its my daughters favorite combo so far, but we have been doing it the old fashion way, its a lot of work! Probably banana or sweet potato baby food. Little one not coming until October, but I want to start testing now! Something green- peas, beans for my baby girl. I would make pureed carrots and potatoes that i can add to other meat or pasta dishes for my little boy. I would make mashed sweet potatoes, yum for the whole family! 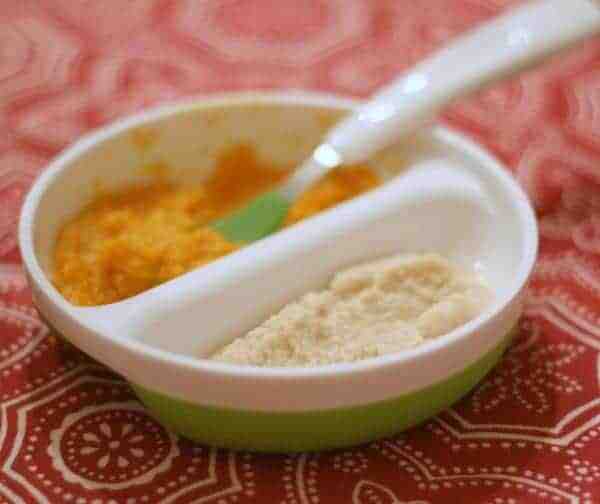 I have a 6-month old that just started on solids last month, so a food mill would be ideal! Sweet potatoes are a current favorite for her. I’m excited to try making pumpkin! I would love to start making applesauce for my family! I think I might try the sweet potatoes for my grandson. I would use this to puree all the fruits and veggies from my parents home for my baby. He already loves carrots and squash! Sweet potatoes! A favorite around here. Hopefully for the baby too. Just had my first baby. I’m excited to make my own baby food. A combination of apples and butternut squash is definitely at the top of my list. I’ve already started making some food for my 5 month old but I could easily use the mill for just about any fruit or vegetable. I’m excited to create combos for him to try like squash with apples and cinnamon…or blueberries, bananas with spinach and yogurt. The possibilities are endless. I would love to try making a sweet potato, apple, and corn combination. My little boy is due next month. I think the first food I’ll try pureeing is the parsnips! I would love to be able to give this to my “baby”. She is 30 years old and is pregnant with her second child. 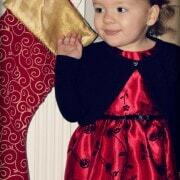 She made virtually all of my almost two years old (second birthday is next month !) granddaughter’s food (sweet potato was her fav!) My granddaughter loves to eat and until very recently (yes “the terrible twos have hit ) would eat most everything including pickles, sushi (not raw fish kind) and capers!! I know she would LOVE to have all this wonderful new baby food making stuff for the new baby (due in december)!!! I would make some yummy carrots!! I will probably try the sweet potatoes first if I won….I received an info sheet from my pediatrician that said not to do beetle, turnips, collated greens, carrots, or spinach homemade due to high levels of nitrates in some of these. The nitrates cause an unusual type of anemia in infants. Have you ever heard this? It’s new to me after 4 kids.